He specialises in applied geophysics and has a research background in structural geology and geomechanics focussed on the evolution of linked fracture networks and induced seismicity. Amongst others, he has advised National Grid, the Environment Agency and the United Nations on the deployment of geophysical technologies. George is a past Vice President of the Geological Society of London, is a Chartered Geologist and a Chartered Scientist and is a member of the Editorial Board of the Quarterly Journal of Engineering Geology and Hydrogeology. 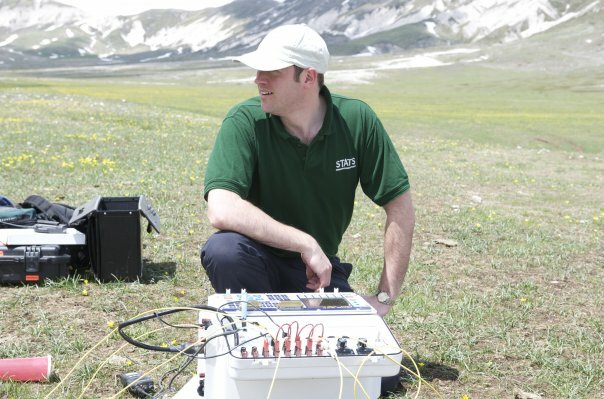 He is a committee member of the British Geophysical Association, and the Near Surface Geophysics Group of the Geological Society of London. He provides expert witness services in cases relating to the use of geophysical technologies, the interpretation of, and reliance placed on, the data acquired. This includes cases of buried service detection, mapping and avoidance. George participated in the first training cycle of the CTBTO organised by the PTS in 2007-2008, and led the geophysics team in IFE08, the first ever On-Site Inspection (OSI) Integrated Field Exercise hosted by Kazakhstan in September 2008. Since that time he has been a regular participant in CTBTO training events, exercises, meetings and workshops. He wrote early drafts of the Standard Operating Procedures (SOPs) for the deployment of geophysical techniques during and OSI, and worked closely with the PTS to develop the Inspection Team Functionality and Functional Field Team concepts and procedures.